" SAVE THE FUTURE WITH N-ZYME ® "
We have been quite a globe-trotter with the slogan above. 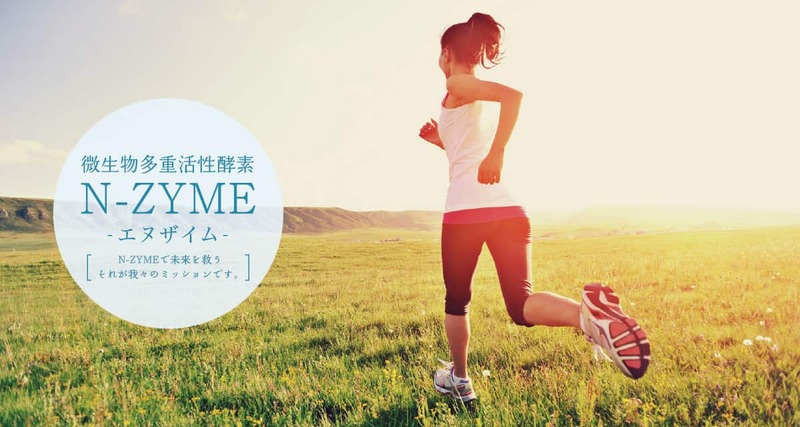 We believe that we would have the future saving and opening with N-ZYME ® by provided N-ZYME ® in every minutes count. N-ZYME is a revolutionary biotechnology that harnesses natural microbial and enzyme functionality with a proprietary protein ‘Super Catalase’ that provides a significant biochemical rate acceleration. This is achieved through improving the kinetic rate of a broad range of enzymes. As such N-ZYME can be considered a technology within the specialization of proteomics. N-ZYME is a powerful core technology in that it accelerates natural biochemical reactions thousands to hundreds of thousands times their normal rate. Combined with N-ZYME 4 core capabilities this makes N-ZYME a technological platform of immense value in environmental management and human and animal health. N-ZYME is a commercialized products which contain dormant beneficial microbes, active multienzyme and other active elements through fermentation process with safety microbes for producing noted above contained materials and freeze-drying process for keeping microbes in the living state. N-ZYME is active in your life. 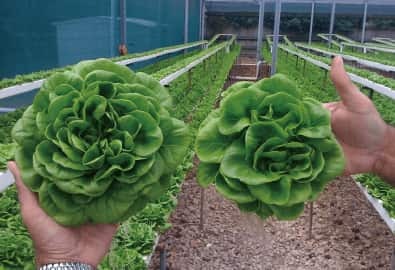 There are wide range of fields from environmental concerns such as Water quality improvement, Odor eliminating and Soil remediation to Agricultural, Aquacultural and health supplement. N-ZYME has been playing an active role outstandingly in Thailand, Japan, Korea, Taiwan, India, Singapore, Philippine, Australia, USA, and the Middle East. N-ZYME has been developed through nearly 20 year research project. 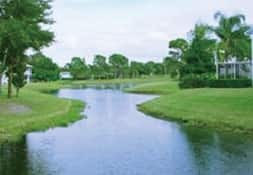 After researching the water sanitization properties of various natural environments, a particular area in the Gulf of Thailand was identified as possessing remarkable abilities to rapidly remove a wide range of pollutants from urban run-off waters. A comprehensive study into the microbial population of mangrove soil samples identified a number of previously undiscovered bacteria strains and rare yeasts amongst the hundreds of thousands typically found in mangrove soil. 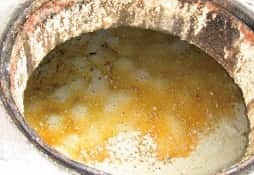 These microbes and their resultant enzymes were shown to be the catalysts of the bio-chemical reactions that were able to rapidly remove the waste products from the water and included the ‘Super Catalase’ enzyme. The next phase of development was to unlock the secret to growing these microorganisms symbiotically and to optimize the production of their respective enzymes and metabolites. 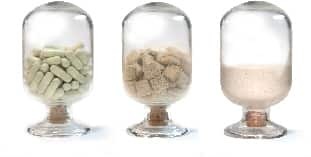 Then an advanced form of vacuum freeze drying was employed putting them into a stabilized product form. The result is the core N-ZYME technology which is now deployed across various applications. The N-ZYME super microbes fight pathogenic and odor causing bacteria, rapidly digest waste compounds, control pollution and generally bring balance back to our environment. 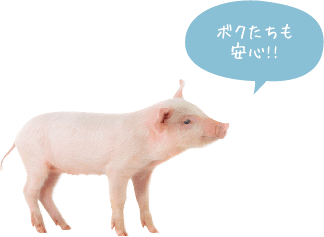 Japan Food Research Center Foundation reported safeness and no toxic amount in the test results both of LC50 and LD50 (in vivo acute toxicity test). 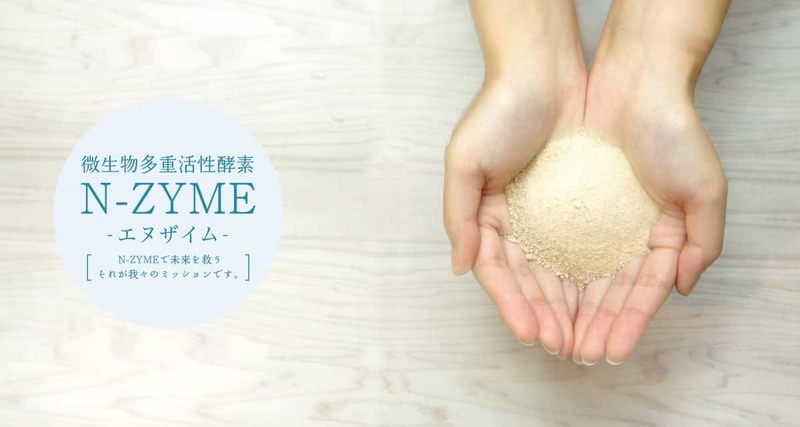 When the devastating Tsunami hit wide areas of South East Asia in December 2004 and East Japan in March 2011, N-ZYME was donated to be used to assist with the relief effort. The remarkable ability to remove odor and prevent the spread of disease directly assisted with the relief and recovery in both of Phuket, Thailand, Banda Aceh, Indonaesia and Touhoku, Japan. The many governments of the region those were present to assist with the relief effort saw first-hand the power of the N-ZYME group which led to its rapid uptake throughout the region. The following images show the use of N-ZYME to spray over in Indonesia and in Eastern Japan for the Tsunami relief effort. N-ZYME is used as in a raw material for a variety of health supplements in more than 10 counties worldwide. There are innovative OEM N-ZYME products which contain rare decomposable alcohol enzymes to prevent and ease a hangover. One of these recorded the 2 million pieces sale a year and, some of other products have outstandingly been expanding domestic and oversea market as health supplements for stimulating digestion, metabolism and immune system activation. On the other hand, we have been performing experimental studies with a University in Japan and, also a joint research study with National Cancer Institutes for making a noticeable impact to the healthcare industry. 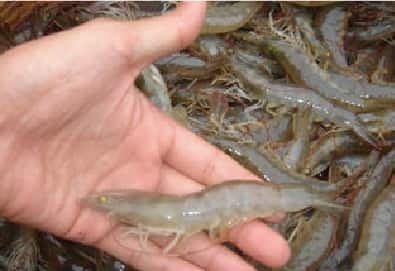 Years ago, the white shrimp farm industry was damaged by EMS disease. In the situation, the farms who applied N-ZYME kept more than 90% of survival rate with non EMS crisis. So there is new market applicable N-ZYME from the stage of hatchery to farming. 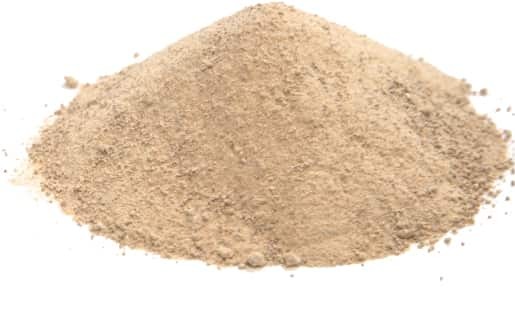 Immediate effectivity and high level of odor eliminating that active enzymes rapidly decomposes all non-living organic matter in origin as a source of odor. The inhibition of pathogens by N-ZYME were verified and documented in reports. N-ZYME is safety, a natural 100% organic culture and replaces harsh chemicals in many of application. 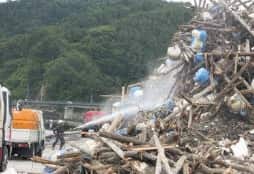 When the devastating Tsunami hits wide areas of South East Asia in December 2004 and East Japan in March 2011, N-ZYME was donated to be used to the relief effort, and received a high evaluation to odor elimination and prevention an outbreak of disease. N-ZYME is friendly for human and environment and, works for treatment waste water and cleaning the food facilities where using organic oils and other matters. N-ZYME decomposes fats into its final end product. In sewage facilities, N-ZYME treats bad odor and waste organic in sewage at the same time. 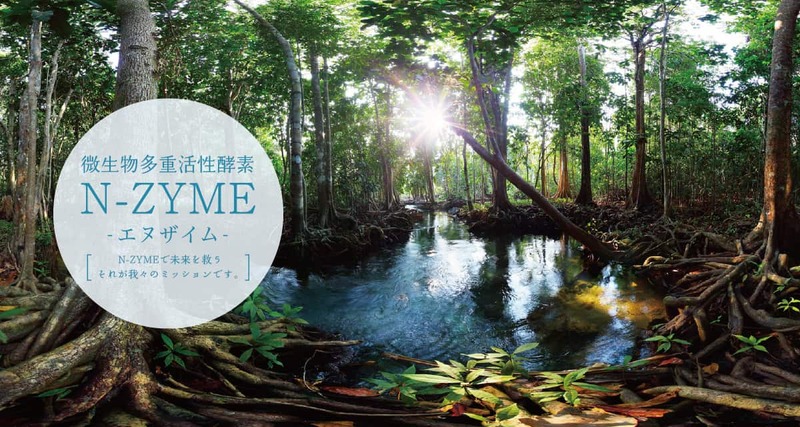 Totally, N-ZYME is friendly for human and environment. N-ZYME beneficial microbes and active enzymes work for decomposing sludge accumulation, controlling bloom of blue green algae and improving water quality. Lake in zoo, golf field and livestock barn etc. N-ZYME is used in agricultural fields as hydroponic culture and cultivation of the soil, and is used as a cleaner and soil remediation. The growth in crop yields is identified in Thailand, USA, Australia, China and Taiwan. A world biggest fruit supplier has been using as a cleaner to reduce deterioration rate of their produce. 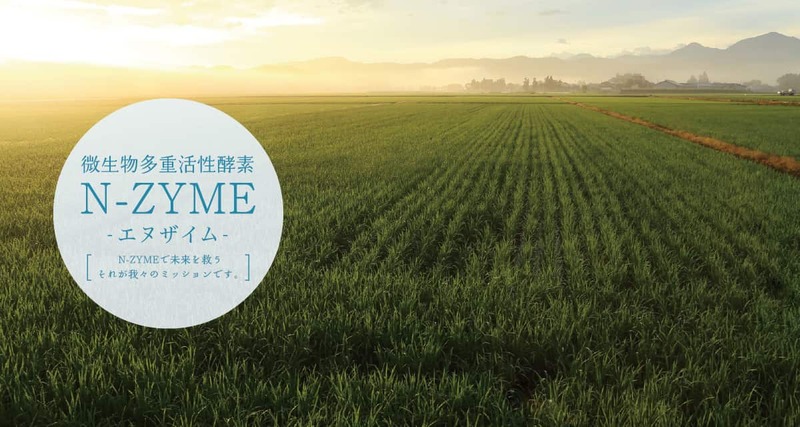 N-ZYME is used in shrimp farming in Thailand and some other countries in South-eastern Asia where famous in Japanese market as supplying most of prawn and shrimp available in Japan. There are wide ranges of applications as for controlling water quality condition from hatchery stage to harvest stage in aquaculture ponds. This consistently usage can be reading to positive results in disease rate of developing. N-ZYME verified its efficacy with a numerical data for feeding to livestock as cattle, swine and poultry. 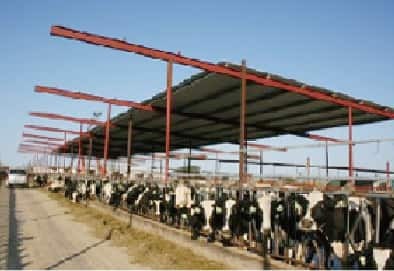 On the other hand, N-ZYME is used it for eliminating odor, managing hygienic environment and decomposing manure in livestock barn without any toxic to livestock and human body. N-ZYME usage is very simple and easy. It is just makes N-ZYME solution and then, splays or covers objects to eliminate odor and inhibit pathogens and, pour into drain to treat waste water. N-ZYME supports consistently and comprehensively in a wide range of application in livestock industry. 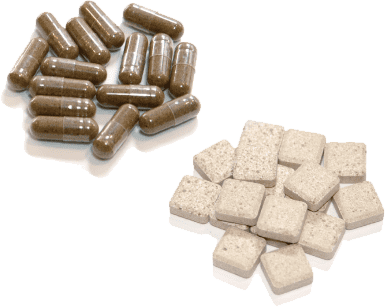 In recent years, enzyme supplement has been booming and, there are many enzyme products in the market but, most of the products do not contain active enzymes. Most of these are used fermented fruit or vegetable extract for making products. In this situation, N-ZYME enables to supply active enzymes as in a raw material which made through fermentation process with safety beneficial microbes to produce such active enzymes and other active elements and freeze-drying process to keep live beneficial microbes. N-ZYME is an original probiotic active multienzyme product containing more than 7 types of active enzymes, beneficial living microbes and active ingredients like organic acid and pediocin. We supply N-ZYME as in a raw material, OEM products and bulk in capsule and tablet, and do wholesale and direct distribution of existing N-ZYME products. Hangover reducer, this is one of advantaged and rare product in the world’s markets. An OEM product recorded the 2 million pieces sale a year. N-ZYME contains two kinds of unique enzymes which decompose both of alcohol and acetaldehyde into their final end products of water, carbon dioxide and heat energy in human body. N-ZYME products for hangover care is totally different from other liver function facilitating products in the existing market. This is new business concept with unique and real physical product. Most of N-ZYME consumer has been taking N-ZYME aim to maintenance of good health on daily basis. It is not difficult nor too much trouble to take more than 7 types of active enzymes at a time, anytime and anywhere. The enzymes beneficially assists digestive function to daily meal, nutrition absorption and metabolic function. Enzyme function is much different from other nutrient like vitamins and minerals. Many N-ZYME products have been consumed with recommendations of medical doctors in hospitals or clinics and, now becoming a part of life for same. We have been supplying many products on OEM basis, not only a food material domestically and abroad. 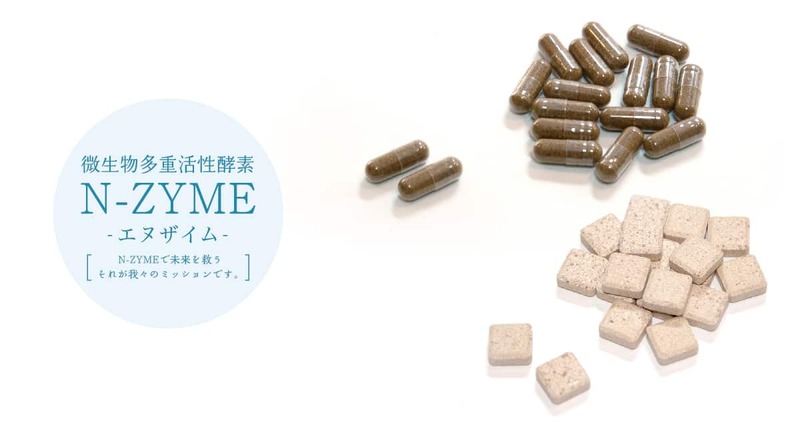 N-ZYME is available to make in hard capsule, powder from and tablet form except in drinking and jelly form which almost be inactivated enzymes by moisture. We provide you with a best service and support development your N-ZYME products on our solid achievement and rich experiences in the world. and Marketing and sales of other foods and industrial goods etc. in global market.